Still from the film On Paper Wings. Local, volunteer-powered Beacon Hill Meaningful Movies screens the documentary On Paper Wings on Friday, August 21 at the Garden House (2336 15th Ave. S.) at 7 p.m. Doors open at 6:15. Free movie, free popcorn! During World War II, the Japanese military developed a new weapon intended to strike directly at the American continent — the balloon bomb. Thousands of hydrogen-filled balloons were attached to bombs and then launched into the jet stream to drift toward North America. When six civilians found a balloon bomb in southern Oregon (near Bly), the device exploded. They became the only people killed on the continental US as the result of enemy action during World War II. 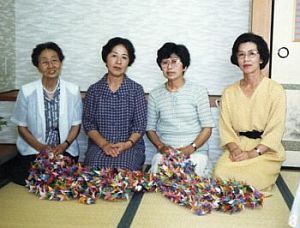 On Paper Wings is the story of four Japanese women who worked on the balloon bombs, the families of those killed in Oregon, and the man whose actions brought them all together forty years after World War II and the balloon bomb project. Event organizers are hoping to have local Japanese-American residents whose lives were forever changed by the removal and internment experience as guests to share their stories. An image from Tess Martin’s They Look Right Through You. Beacon Hill animator Tess Martin attracted attention last year by animating a three-minute film, The Whale Story, on a large Capitol Hill wall. This year she’s back with three new films including Barzan, which played last Sunday at the Kirkland Performance Center, and They Look Right Through You, playing with the feature Furever on Sunday, June 9, at 6:30 p.m. at the Egyptian Theatre as part of the Seattle International Film Festival. She took some questions about her new work over email. Beacon Hill Blog: Please describe the three new projects you’re showcasing in this year’s Seattle International Film Festival. Two are shorts, one is a feature including your sand animation. Which project was the easiest and which the most difficult? Tess Martin: The three projects I have in SIFF this year are two animated shorts directed by myself, A Walk in the Woods and They Look Right Through You, and then I have 7 minutes of sand animation in a documentary called Barzan directed by Alex Stonehill and Brad Hutchinson. They are very different — A Walk In The Woods is a one minute short, the shortest film I’ve ever made! And it is animated with objects–sticks and leaves, etc. They Look Right Through You is a nine-minute short, and I was working on it on and off over 18 months, but was seriously animating for about 4 or 5 months. This one is marker and paint on glass with some time-lapses thrown in. The sand animation in Barzan took me about 7 months all together. In some ways Barzan was the hardest because we picked some very challenging things to represent in sand, but the results were worth it. 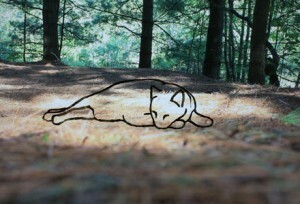 Beacon Hill Blog: They Look Right Through You combines interviews with pet owners and marker-on-glass animation. Had you used this style of animation before? What are its particular challenges? How did you go about obtaining the interviews for the soundtrack? What was Susie Tennant’s contribution? Tess Martin: I hadn’t used marker-on-glass animation before. I was playing around and discovered that it’s very nice for animation because the marker can be easily wiped away, as opposed to paint, which is often stickier. I’d say the main challenge with marker-on-glass is that is requires a lot of drawing! You’re basically re-drawing the image over and over, and erasing where it was previously, so you have to be on your drawing game so to speak when you’re animating. In October or November 2011 I put a call out on my neighborhood listserv for people who were willing to be interviewed about their pets. I got a lot of responses and spent a few weeks traipsing to people’s homes and talking to them with an audio recorder. I read about Susie Tennant’s situation in one the Seattle weeklies, because her and her family were raising money for her medical care. The story included one sentence about how her dog alerted her to the fact she had cancer. I asked her if she would be willing to share her story for my little film. She was gracious enough to accept, and her story is so compelling that it became one of the two main stories in the film. did you spend in East Haddam, CT, where the film was made, and what did you do there? What were your impressions of the area? Tess Martin: The film was animated with objects I collected in a big park that makes up a lot of the grounds of the I-Park artist residency. I won a residency there in August/September of 2012, and I was mostly working on They Look Right Through You during that month.But I had hit a wall with that film and had 4 days of the residency, so I decided to do something completely different. I traipsed around the beautiful park, brought all the material back to my studio and created a story with it. I thought it would be fun to try to make it exactly one minute. So that’s how that happened — it’s the shortest production time of all my films! I then worked with my composer, Spencer Thun, to get a beautiful score for the film that hit all the emotional points in such a short time. Tess Martin: I was approached by the Barzan crew and they showed me the cut of the film they had so far, and where they were envisioning the animated segments going, and what the animated segments needed to contribute to the film. Once I had a clear idea about that I storyboarded the scenes as I felt they should be, and then there was a little back and forth about particulars. I’d say we met about 4 or 5 times, with a lot of email. It was a very happy relationship because to their credit they were on board with most of my ideas even though it must have been hard to picture exactly what I was talking about. Sand is great fun and challenging of course. You’re working with a very thin layer of sand on a flat surface, and yes, I was finding sand around my desk for a long time afterwards. You just have to be really careful not to bump the table or sneeze near your work. Beacon Hill Blog: How long have you lived on Beacon Hill? How does it compare/contrast with other places you’ve lived? How does the neighborhood/community influence your work and your attitudes? Tess Martin: Beacon Hill is the only neighborhood I’ve lived in in Seattle since I moved here five years ago. It’s certainly one of the most residential areas of a major city I’ve lived in, even though I live right on the main road, so for me the experience is probably less quiet than most Beacon Hill residents. But I love living in a quiet friendly place with other friendly people. I’d say the best thing I get out of Beacon Hill is its diversity — it’s nice living in a neighborhood where there are residents of all ages and ethnicities — it feels like the real world. Beacon Hill Blog: What are your plans for the future? Tess Martin: I’m working on a few films right now and I may be moving to The Netherlands for a Masters program at the end of the year — it’s still up in the air but could be very exciting. Station 13 as it was in 2010. Celebrate its new renovation at a community open house this Saturday. Photo by Jason Simpson. The Seven Hills Seattle and Scandinavian history walk starts on Queen Anne Hill at 9 a.m. and finishes right here on Beacon Hill. Information here. Fire Station #13 Open House from 11-1 p.m. will celebrate the station’s reopening after renovation. All are welcome. Information here. Franklin Arts Festival from 11 a.m. – 3 p.m will feature music, art, and food for the whole family. Information here. Beacon Hill animator Tess Martin’s short, Hula Hoop, will play at SIFF Cinema Uptown at 10 a.m. as part of the Seattle Times and SIFF 3 Minute Masterpiece contest. Admission is free. Information here. All are invited to a Lewis Park work party to assist in improving the park. These volunteer events are every first and third Sunday, starting at 10 a.m. at the park, 12th Ave S and Golf Dr S. Tools, gloves, water, and refreshments are provided. A bit later in the day is a cooking demo at El Centro de la Raza with chef Vincent Rivera of Jazz Alley, who will demonstrate how to cook carnitas, pozole, and ceviche. Information here. And finally, the ROCKiT Community Arts board meeting is Sunday from 1-3 p.m. at the Garden House, 2336 15th Ave. S. The meeting is open to the public. This is the first of an occasional series of “Get Off the Hill” posts, in which the BHB will mention some entertainment options that aren’t in the neighborhood. We love spending time on Beacon Hill, but we can’t spend all our time here. Occasionally it’s worth leaving the hill for a good movie or a concert. 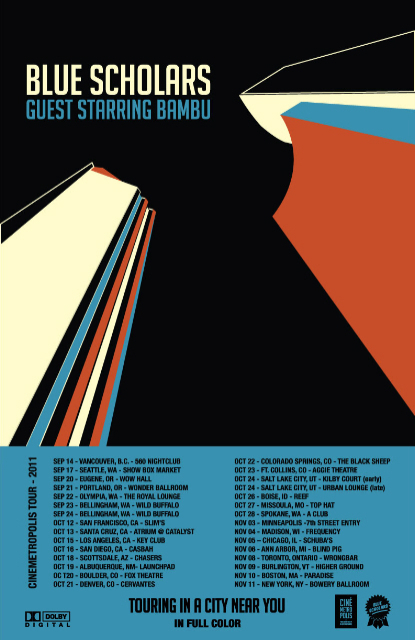 Beacon Hill hip-hop duo Blue Scholars have just started their first nationwide tour and will be playing in front of the hometown crowd in an all-ages show at the Showbox at the Market, Saturday night, September 17. The tour will take them all the way to New York City, where they’ll wrap up the whole shebang on November 11. Jefferson Community Center has been hosting a free Harry Potter movie marathon to prepare for this week’s opening of Harry Potter and the Deathly Hallows, Part Two. All are welcome, whether wizard or Muggle. 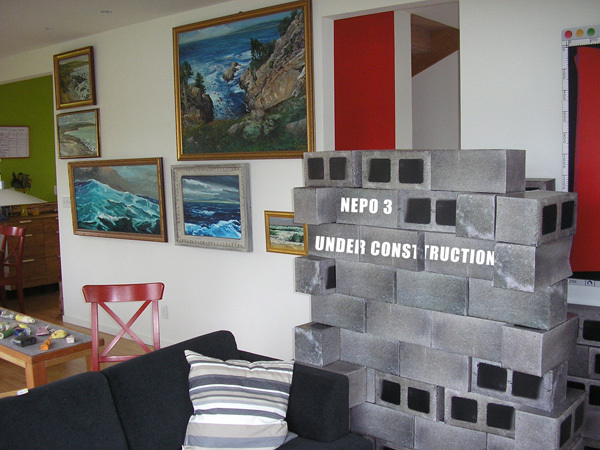 The Jefferson Community Center is located at 3801 Beacon Ave. S.
Elemental art is coming to the Hill on Saturday night, June 5, 6:00 pm to midnight, with the third installment of the home_page.project: NEPO 3: Air, Water, Fire (We Will Leave the Earth Behind). This is a one night art/performance event at NEPO house, 1723 South Lander Street. The event will include installations, music, visual art, and even fire juggling and “a cell phone launch to outer space”! Participating artists include Lauren Atkinson, Lara Davis, David Lasky, Aaliyah Gupta, Lauren Klenow, Julia Haack, Mark Callen, Stefan Knorr, Serrah Russell, Gitane Versakos, Jason Hirata, Matt Hilger, Timothy Cross, Rumi Koshino, Klara Glosova, Emily Pothast, David Golightly, SP Weather Station (Natalie Campbell and Heidi Nielson), Eric Ostrowski, Janel Twogood, Matt Baker, Sebastian Shaw, Christopher McElroy, and Whiting Tennis. For more information about the art and the schedule, see the website. Tonight at McCaw Hall, Pacific Northwest Ballet opens an all-new production of George Balanchine’s classic Coppélia. Two young dancers with Beacon Hill connections will be featured performers. Alejandra “Ali” Prevost-Reilly of Seward Park is a student in Grade 5 at Kimball Elementary School here on Beacon, and Kyrlia Young lives on North Beacon and is in Grade 6 at Mercer Middle School. Both are eleven years old. Congratulations to Ali and Kyrlia! Bethany UCC Church has been hosting a community film festival with discussion focusing on the topic of food justice, health and nutrition. Saturday, June 5, Fast Food Nation will be screened at 6:30 p.m. All are welcome, and the event is free, but donations are accepted. Childcare is available. Bethany UCC Church is located at 6230 Beacon Avenue South. The next event in the series will be June 19, when scientist David Suzuki will discuss Cuba’s organic urban agriculture projects, with commentary from Tom Warner. New coffee shop The Station and neighborhood baker A Touch of Sweden are hosting a sampling event on Sunday, June 6 from 1:00 pm to 5:00 pm. Those who come by to give feedback on the pastries and sandwiches that The Station should carry will be eligible to win free coffee, a free pie or cake, or other goodies. Pastries will be available at a reduced price. (We recommend the cinnamon rolls. They are especially good.) 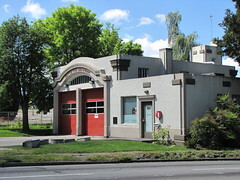 The Station is located at 2533 16th Ave South. In other food and drink-related news on the hill, Inay’s Restaurant opened their new cocktail lounge last Friday. You can visit it at 2503 Beacon Avenue South. A decision came down last week in a land use application to allow Clearwire antennas to be added to a City Light transmission tower at 4999 P Beacon Avenue South. A Determination of Non-Significance with conditions was made, along with decisions to conditionally allow the antennas to be located in a single-family zone and exceed the underlying zoned height limit. For more information, see this DPD website. Don’t forget the Beacon Hill Festival on Saturday!